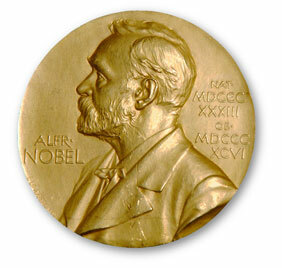 The Nobel Prizes in science will be announced this week. For more than a century the prizes have recognized high achievement in physics, chemistry and medicine. Some scientists crave the prizes so much that they get obsessed with them. A prominent, world-famous chemist once had lunch with my graduate school advisor. After a few minutes he went off on a tirade against the Nobel committee, cursing them for not giving him the prize. He never got it, and he never got over it. The Nobel can bring fame and recognition, but it can also make the lives of those who live for them miserable. A human prize created by a human committee based on the will of a human who established it to atone for a better method of killing people should not cause people such agony. And yet, in many ways, the prizes reflect all that is good and bad about human nature. The physicist Phillip Lenard later turned out to be a Nazi who denounced Einstein and his relativity. The celebrated Werner Heisenberg wasn’t a Nazi, but he controversially participated in work toward an atomic weapon in Germany during the war. Fritz Haber made an even more damning pact with the devil. Haber and his collaborator Carl Bosch kept alive, by one measure, one third of the world’s population by inventing a process to manufacture ammonia for fertilizers from nitrogen in the air. Haber won the Nobel Prize for chemistry in 1918, right after he had spent the First World War inventing chemical weapons that led to the deaths of tens of thousands. António Moniz who won the prize in medicine in 1949 pioneered the highly controversial procedure of lobotomy which, even though it seemed like a good idea then, incapacitated thousands. And William Shockley who co-invented the transistor and inaugurated Silicon Valley later became infamous for promoting racist theories of intelligence. The moral landscape of Nobelists even in science is unambiguous, so one can imagine how much worse it would be and in fact is in areas like peace and economics. There are also all the other human problems which have been highlighted with the prizes. The ratio of those who deserved the award but did not get it to those who did must be at least a hundred to one, although it’s at least possible to make an honest argument that those who did get it largely deserved to. Some spurned candidates have taken it in their stride and jest about it. The astronomer Jocelyn Bell-Burnell should have received the prize for the discovery of pulsars – rotating neutron stars; instead only her PhD advisor Anthony Hewish shared it. But Bell-Burnell has taken the fifty-year controversy in good humor, joking that it’s better that people ask her why she didn’t win it than why she did. The fallout from the controversy might have affected more than just Bell-Burnell: the astrophysicist Fred Hoyle who deserved a share of the 1983 prize for his groundbreaking work deciphering the synthesis of the elements in stars was sidelined, and some think it might have been for his vigorous public advocacy of Bell-Burnell. Most egregious is the three-person rule which prevents many other worthy individuals from getting the prize almost every year. In one case, just like the chemist who was complaining to my advisor, one bitter scientist who felt especially ignored for the lack of recognition of his work on MRI took out a full-page advertisement in the New York Times protesting the omission. Even otherwise world-renowned scientists are not immune to wanting even more recognition. Robert Burns Woodward, by a very broad consensus the greatest organic chemist of the 20th century, wrote a remarkable letter to the Nobel committee protesting the chemistry prize in 1973 which was published in The Times of London, telling them that they had committed a grievous error by not including him among the winners; Woodward in fact had already won the prize in 1965 for his seminal contributions to the synthesis of complex organic substances like chlorophyll, and he would have undoubtedly won another one in 1981 with Roald Hoffmann had he not died the year before. There is also a pronounced lack of women winning the prizes, especially in physics which has not seen a woman win for fifty years. While disappointing, to some extent this is not surprising since women haven’t been represented in higher physics education and the physics workforce because of systematic barriers; Princeton University did not admit female physics students in its astronomy graduate programs until the 1960s; the problem really should be addressed at a much lower level. Fortunately there have been an increasing number of women in physics and other sciences in the last twenty years, so hopefully in a few years we should start seeing women represented in the list. The prizes have also been overwhelmingly won by scientists from the United States and Europe: this fact is even less surprising since these countries are where most pioneering scientific research after the Second World War has taken place. The only Asian country which has been well represented has been Japan, and the Japanese have progressed in science and technology after their virtual destruction in World War 2 at breakneck speed. Chinese, Indian and other scientists have won a few of the prizes, but it’s always been for work done in the United States or Europe. It’s noteworthy therefore that three years ago, Tu Youyou became the first Chinese scientist and woman who won a Nobel Prize for work done in China; she won for the discovery of the antimalarial drug artemisinin. If China, India and other countries pour money into their scientific institutions and train the next generation of scientists, if they bring the same spirit of adventure, risk-taking and perseverance that has animated scientists in the United States and Europe, it’s inevitable that they will start producing Nobel-quality research within a few decades. The history of the Nobel Prizes also offers an interesting window on changing developments in science. For me, the most promising insight they offer is of science as a tool-driven rather than as an idea-driven revolution. If you ask most of the public who their favorite scientists are, they are likely to be theoretical scientists like Einstein, Newton, Galileo and Hawking. And yet, as brilliant as these scientists’ work is, the actual work of uncovering new facts is done by experimentalists and not theorists, and yet the popular conception of science is biased toward theorists. For instance, let’s consider Nobel Prizes in physics where the demarcation between theory and experiment is well defined. By my count, among the 73 prizes awarded since the end of the war, no less than 27 have been awarded for new techniques; these include bubble chambers, laser spectroscopy and scanning tunneling microscopy, all of which have revolutionized many branches of physics. Science develops through both new tools and both ideas, but the image of science in the public mind is rather skewed and consists of singular minds coming up with great ideas. The truth is both more mundane and more important; experimentalists are the ones who actually find new things, while theorists are the ones who predict or explain them. You seldom get a Nobel Prize for explanation. You can get one for prediction, but as Niels Bohr rightly said, prediction is very difficult, especially about the future, so there have been very few genuinely groundbreaking predictions even in physics that were later verified by experiments. Paul Dirac’s prediction of antiparticles stands out as being especially remarkable, although it might have exaggerated the role that beauty and elegance play in theoretical ideas and set up an entire generation in physics for believing that truth equals beauty. In chemistry and medicine it’s far easier to accept the idea of science as a tool-driven revolution, partly because most chemical and biological systems are too complex to be reduced to first-principles explanations the way they can be in physics. The image of singular minds also leads to the other big misconception regarding Nobel Prizes and science in general; the belief that lone geniuses do most of what’s important in science. In a trivial sense this has always been false since nobody invents or discovers something from scratch and everybody stands on the shoulders of giants. But it’s also becoming false in a big way, and tool-driven revolutions in science are largely responsible for the increasingly gaping discrepancy. The Higgs boson which was recognized a few years ago came out of the minds of at least six people, but its discovery was enabled by hundreds working at the Large Hadron Collider (LHC) in Geneva. Similarly, the discovery of gravitational waves for which three physicists were rightly awarded the prize last year was made possible using giant detectors that were constructed, operated and maintained by hundreds of researchers. Research now also spans multiple disciplines, and many important discoveries will not fit cleanly within the categories of physics or chemistry unless the definition of the disciplines themselves is expanded. Clearly there was no way Alfred Nobel and his contemporaries could have seen this evolution of science into a highly interdisciplinary endeavor collectively practiced by hundreds of people from different countries. And yet even in 2018 the prizes seem to be stuck in Nobel’s time. To keep the prizes relevant, it is imperative that they be expanded to honor entire teams spread across many fields. Perhaps a compromise would be to go the way of the much maligned peace prize, where both individuals and entire groups are recognized in the same year; the prize awarded to Al Gore and the IPCC for climate change would be a good example. At the same time, I am also troubled by some who seem to take the other extreme position of saying that individuals should never be awarded the prize. This seems to me to be a kind of postmodern position that is driven more by communal ideology than facts. One of the signature features of scientific research is its diversity. Science may be done by large teams, but it will continue equally to be done by lone individuals. Even though they may stand on the shoulders of giants, singular minds like Einstein and Pauling do occasionally come along who see much further than anyone before. I certainly do not think Peter Higgs shouldn’t have been awarded the prize; I simply think that the LHC collaboration of scientists, engineers and technicians should also have been recognized. Ultimately the Nobel Prize is a human institution, and like Thomas Jefferson, it embodies both glory and folly. To some this may make it imperfect and unworthy of recognition, but to me, the fact that the prize embodies the same complexity that makes humans so human is exactly what makes it so special, and worth celebrating.